Click here to listen to a podcast of this highlight. The feed is located here if you would like to subscribe. In the summer of 1829, Abdul Rahman Ibrahima returned to Africa after 40 years of enslavement in the United States. Having obtained his freedom via the agency of President John Quincy Adams, he set off on the voyage that was supposed to take him to his birthplace in Timbuktu, in what is now Mali. However, he made it only as far as the American colony in Monrovia, Liberia, where he died July 6, 1829, shortly after his arrival. This month, Documenting the American South remembers the remarkable story of a Muslim prince who became a slave in Mississippi. Much of what is currently known about Abdul Rahman Ibrahima comes from a pamphlet titled "A Statement with Regard to the Moorish Prince, Abduhl Rahhahman," written by Thomas H. Gallaudet, one of the co-founders of the American School for the Deaf. According to this account, during Ibrahima's childhood in Africa, his father was sent to conquer the "Soosoos" (also spelled Susu or Soso) and founded a new capital of the kingdom of Futa Jallon in a town called Timbo. Ibrahima therefore moved from Timbuktu to Timbo at age five, returning to Timbuktu to attend school at age twelve. Around 1788, at the age of approximately 26, Ibrahima was taken captive after a raid against a rival tribe, the "Hebohs." 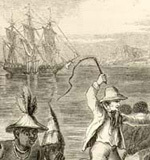 Ibrahima's captors sold him into slavery, and after surviving the Middle Passage, he was auctioned to Colonel Thomas Foster, on whose Natchez, Mississippi, cotton plantation he became a field hand. At least one failed attempt to procure his freedom—on the part of a Dr. John Coates Cox, who had met Ibrahima in Africa and who was familiar with his background—was made before the Adams administration intervened. The groundwork for Ibrahima's manumission, according to twentieth-century biographer Terry Alford, was laid by Andrew Marschalk, who became convinced of Ibrahima's claim to be the son of the ruler of an African kingdom. Erroneously believing that he was from Morocco, Marschalk informed the sultan of Morocco about Ibrahima's plight and forwarded a "letter" Ibrahima had written, which actually consisted only of Koranic verses that he had memorized. Despite Marschalk's error, the sultan, after reviewing the verses, promptly offered the American consul funds to finance Ibrahima's return. The Adams administration was also convinced of the truth of Ibrahima's story, and, in 1827 or 1828, it authorized Marschalk to procure his freedom. Shortly thereafter, Ibrahima embarked on his fateful voyage to Africa. Gallaudet's pamphlet, published in 1828, does not complete the story of Abdul Rahman Ibrahima, but Alford's biography explains that the pamphlet—sold as an attempt to fund the release of Ibrahima's family and their subsequent return to Africa—did not raise sufficient funds to free his large family, so he was accompanied only by his wife, Isabella. After Ibrahima's death—caused by what Alford describes as "coast fever"—Isabella remained in Liberia and was later joined by two of her sons; at least three sons and four daughters remained enslaved in Mississippi. Gallaudet's short account is one of hundreds of slave narratives published by Documenting the American South in its "North American Slave Narratives" collection and is one of several accounts of Muslim slaves found there. Works Consulted: Alford, Terry, Prince Among Slaves, 30th Anniversary Ed., New York: Oxford UP, 2007; Austin, Allan D., African Muslims in Antebellum America: Transatlantic Stories and Spiritual Struggles, New York: Routledge, 1997.